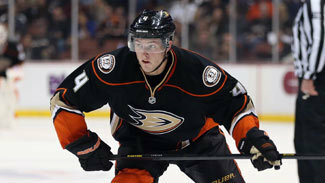 ANAHEIM -- When defenseman Ben Lovejoy was traded to the Anaheim Ducks in February, he "knew nothing" about this Cam Fowler kid. Lovejoy had spent his entire career in the Eastern Conference, with the Pittsburgh Penguins, and he couldn't get to know his new teammate right away because Fowler was out with a concussion. But then a scouting meeting brought Fowler to life. "We were doing video of the other team, and I remember seeing Cam on the point and I'm like, 'Who is this guy?" Lovejoy said with a laugh. " 'Why isn't he playing?' "
Lovejoy saw what many first see with Fowler: the skating ability and the natural offensive flair. Paired with Fowler since the end of last season, Lovejoy has seen the evolution in Fowler's game as he's developed the defensive side and taken the next step in his career. With Anaheim missing its top three defensemen from last season because of injury, Fowler is averaging a team-high 24:04 of ice time. He plays in all situations and, with Lovejoy, handles much of the top defensive assignments. The two are a combined plus-15 going into a game Sunday against the Edmonton Oilers. "He came into the League as an offensive defenseman, but this season he's really prided himself on almost being a shutdown defenseman," Lovejoy said. "He's not your prototypical shutdown defenseman. He's not a big, imposing guy, but he can skate with the best players in the world. I think that that has been such an asset for our team." Fowler, who turned 22 this month, has taken ownership of the role. He played a career-high 32:33 in an overtime game against the San Jose Sharks on Nov. 30. During Anaheim's challenging four-game stretch against San Jose, the Los Angeles Kings, Chicago Blackhawks and St. Louis Blues, Fowler and Lovejoy were on the ice for only two goals against at even strength. Minnesota Wild forward Zach Parise doesn't see why Fowler shouldn't be in consideration for the U.S. Olympic team for the 2014 Sochi Olympics and beyond. "I think he has a great chance this year," Parise said. "That's just my opinion. Down the road? Definitely." Anaheim coach Bruce Boudreau first put Fowler with Lovejoy at the end of last season, and the two clicked in the 2013 Western Conference Quarterfinal series against the Detroit Red Wings. Fowler cites that as a turning point. "After last season, especially after our playoff series, the coaching staff gave me a little bit more responsibility and I think I was able to step up and I thought I played pretty well in the playoffs," Fowler said. "We didn't get the result that we wanted, but I think I grew a lot as a player. Coming into this season, I think Bruce wanted to put a little more responsibility on me. It's really helped me complete my game into an overall defenseman." Boudreau has gone so far as to say, "This is Cam's breakout year as a defenseman. It's not just that he can skate." Boudreau inherited Fowler when he was on his way to a confidence-crushing minus-28 season in 2011-12. Fowler was 20 then and had to take on too much responsibility. Anaheim righted itself that spring under the newly-hired Boudreau, but too late to make the Stanley Cup Playoffs. Fowler was expected to thrive under Boudreau much like Mike Green did with the Washington Capitals. After all, Fowler was projected as a "prototypical offensive defenseman" and "power play quarterback for years to come" by the late E.J. McGuire, former director of the NHL Central Scouting Bureau, before the 2010 NHL Draft. McGuire projected Fowler as a Brian Leetch-type player. But for Fowler, whose love of the game has driven him throughout his career, it wasn't a pleasant period. Even last season, Fowler went 33 games before he scored a goal. "The biggest thing was that the organization and my teammates and coaching staff still had a lot of confidence in me," Fowler said. "If you look to the way I played to my second year, to the way I play now, it's a huge difference. The main thing is just completing my game into [becoming] an overall defenseman, which was something I needed to learn how to do." Fowler said his pairing with Lovejoy has a lot to with it. Lovejoy was a rather low-key arrival in Anaheim, but has become an integral part of the defense. When Lovejoy re-signed in the summer, Boudreau called him and told him he expected the two to be paired again this season. During intra-squad scrimmages in training camp, Lovejoy pointed to them being matched up against the Ryan Getzlaf line. Lovejoy and Fowler had a conversation about being a shutdown pair. It's come out of necessity with Francois Beauchemin, Luca Sbisa and Sheldon Souray out with injuries. "We take a lot of pride in our games," Lovejoy said. "We've got guys playing that haven't played huge roles in the NHL, and we're fighting for respect. We don't want to be the team's liability. We want to be an asset to this team, and we want to do everything we can to win."